Hydro-insulating film made of polyvinyl chloride used for the protection of buildings and engineering objects from moisture and water. ERGIS patented their own system of placing film on high gradient surfaces. 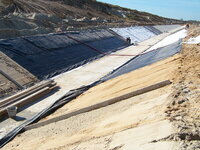 - insulation of road and rail tunnels. possibility of recycling – neutrality for the environment. Basic film thicknesses are presented in the table above. It is possible to make films of other thicknesses from 0.2mm to 3.0mm on customer's individual request. To reduce work at a building site, it is possible to prepare in advance films in a form of sheets with standard dimensions of 6 m x 25 m. It is also possible to prepare sheets of other dimensions after consulting the manufacturer. Flexible sheets for waterproofing — plastic and rubber damp proof sheets including plastic and rubber basement tanking sheet. Geosynthetic barriers. 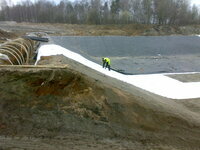 Property requirements for products used in the construction of water reservoirs and dams. Geosynthetic barriers. 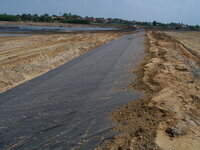 Property requirements for products used in the construction of canals. Geosynthetic barriers. 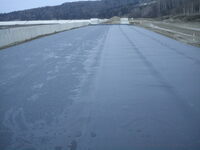 Property requirements for products used as a fluid barrier in the construction of tunnels and underground structures. Geosynthetic barriers. Property requirements for products used in the construction of liquid waste disposal sites, transfer stations or secondary containment. Geosynthetic barriers. Property requirements for products used in the construction of solid waste storages and disposal sites. Measurement of angle of repose - measurements of friction resistance of PVC IZOFOL film in contact with various non-cohesive soils, conducted in Geotechnical Laboratory of the Department of Geotechnical Engineering at the Warsaw University of Life Sciences (SGGW).